Vladimir Zubitsky was born in 1953 in Goloskogo, Nikolaev. He began to play the bayan at the age of 6 in the Krivoy Rog Childrens Musical School. From 1969 to 1971 Vladimir took lessons at the Gnessin Musical College under Vladimir Motov. From 1971 to 1979 he continued his musical education at the Kiev Conservatory of Music where he was taught by Professor Vladimir Besfamilnov on accordion, V. Gnedash as a conductor and composition by M. Skorik. Graduated from the Kyiv P. Tchaikovsky State Conservatoire (now: National Music Academy of Ukraine) as an accordionist with Prof. V.Besfamilnov (1976), a composer with Prof. M. Skoryk (1977) and a symphony and opera conductor with Prof. V. Kozhukhar and V. Gniedash (1979). His international musical career began in 1975, when Vladimir won the International Accordion Competition "Coupe Mondiale", in Helsinki, Finland. A year later, Vladimir started performing as a concert artist of the Ukrainian Concert Organisation and has since given many concerts in many countries of the world. 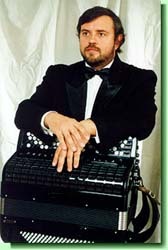 Vladimir Zubitsky is a well known composer of original accordion music. His more famous compositions include Children Suite No.1, Karpatskaya Suite, Partite Concertata in Mode Jazz-Improvisazione, which are performed by famous accordionists all over the world. Besides accordion music, Vladimir Zubitsky has composed 7 symphonies, 3 operas, 2 ballets, 7 concerts, chamber and choral music. Vladimir was recognised for his outstanding composition when he was awarded the Premium of UNESKO in 1985. Currently living in Italy, Vladimir performs regularly as a soloist as well as in the family ensembles "Duo Zubitsky" and "Quartetto Zubitsky", they play various style of music, such as: baroque, romantic, classic, modern and jazz. He composes accordion music and teaches the accordion, attends many workshops, gives lectures and been on a number of international competition juries. Vladimir has organised the "Accordion Seminars with Zubitsky", held in Pesaro, Italy. He has been the President of the Ukrainian Accordion Association.